Beginning Thanksgiving night, 15306 Vireoglen Ln. will glow bright with lights that will twinkle to music that can be heard on the car radio. A sign on the curb outside of the house will have the station number to tune into. It is in the Vireo Ridge community of FishHawk Ranch. Christmas L ane is an extraordinary light display that originated in 1980 for the Dover community. The display stretches over three acres of property; 45,000 sq. ft. of display. There is a train for children less than 48 inches tall that nightly takes more than 600 children through a winter wonderland which includes a tunnel of lights. Two weeks before Christmas, Santa and Mrs. Claus, along with two of his elves, attend nightly in his sleigh. Real characters such as Rudolph and Frosty the Snow Man make spontaneous appearances and a complete nativity scene. This is a free display, but donations are accepted to help offset the annual expense of the display. Christmas Lane is located at 2091 Wooten Rd. (two miles north of S.R. 60). Visit www.christmaslane.org. 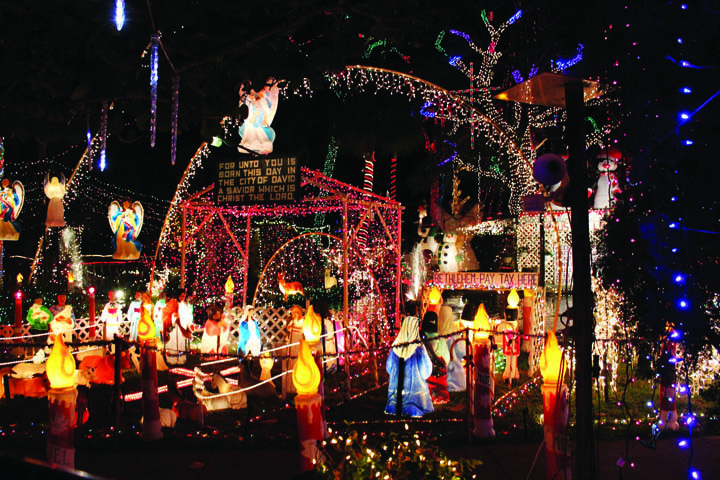 The 2014 Oakdale Christmas Light Display is at a private home located at 2719 Oakdale St. S. in St. Petersburg. Now in its 38th season, this light show is among the largest and longest running in the United States and rated in the top three nationally by The Today Show. One-half acre in size, there are over 608,000 lights. A walking tour is included. There is a large 18-train HO scale railroad with carnival rides, inflatables, snowmen, a computerized music/light show and more. Admission is free. 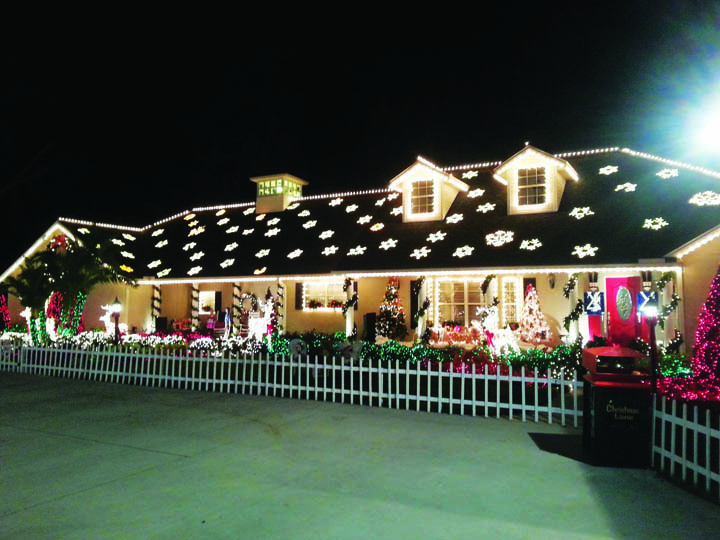 Visit the Oakdale Display from Friday, November 28-Saturday, January 3, 2015 from 6-10 p.m. For more information, visit www.Christmas Display.org. The DeBrocke light display will take place at 11720 Stonewood Gate Dr. in Riverview beginning Monday, December 1 through Wednesday, December 31 from 6-9:30 p.m. on Sundays through Thursday and 6-11:30 p.m. on Friday and Saturday nights. Visit www.debrock elights.com. Nights of Shimmering Lights provides over two miles of dazzling displays, illuminated tunnels, and dancing LED lights. Weave through over a dozen themed areas that appeal to kids of all ages and enjoy over 2,000 beautifully sculpted light displays while listening to holiday tunes on the car radio. After seeing all of the lights, an entire Christmas Village awaits to explore with family. Drink hot chocolate and watch holiday movies; take a picture with Santa. Join in with various kids’ crafting projects from vendors and ride a train. 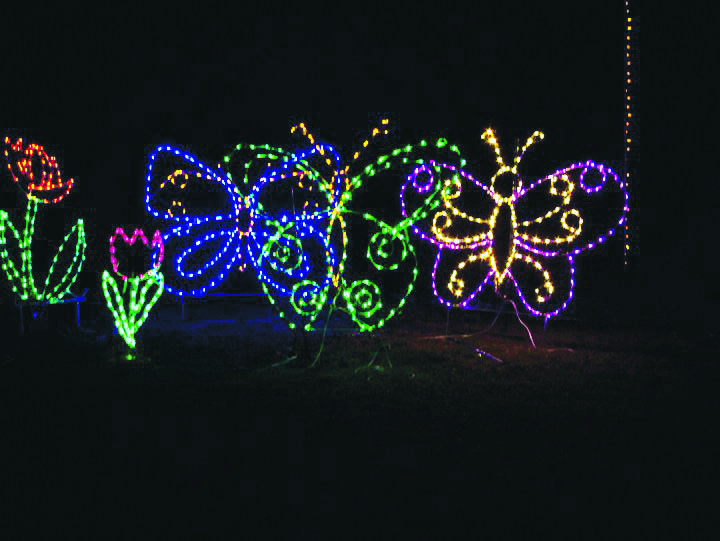 Nights of Shimmering Lights takes place from Saturday, November 29 through Saturday, January 3, 2015 at 215 Sydney Washer Rd. (off S.R. 60) in Dover. The cost is $20 per carload Thursday-Sunday and $15 Monday-Wednesday. Call 629-1561 or visit www.nightsofshimmeringlights.com. Enjoy the Christmas lights and decorations in Barrington Oaks East. For more than 25 years, the neighborhood off Lumsden Rd. (between John Moore and Bryan Rds. ), will open its gates for neighbors to enjoy this festive season. This year the gates will be open from Saturday, December 13 to Friday, December 27 from 6-11 p.m. and until 12:30 a.m. on December 24 and 25. On Christmas Eve and Christmas Night it will also feature luminaries. The Duncan Tree Circle neighborhood (off of St. Cloud Ave.) in Valrico is a great place to see the lights. Most of the homes in that subdivision participate and decorate. Know of any other great light displays worth mentioning? E-mail michelle@ospreyobserver.com and we will include at www.ospreyobserver.com.